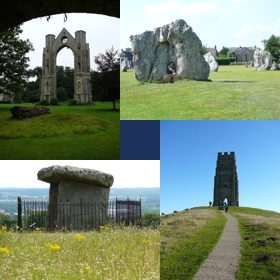 The purpose of this website is to publish dowsing maps relating to what are commonly known as earth energy lines but specifically those lines that are connected with neolithic sites and places of worship both old and new. It is a "work in progress" and is being continually updated as new map data is prepared. To make the project manageable, at the moment I am concentrating mainly on the group of lines going through Glastonbury Tor. The site can be considered to be a continuation of the pioneering work of Hamish Miller and Paul Broadbent, in the late 1980's, as they tracked the famous Michael and Mary lines from Lands End to the Norfolk coast. As you will see, both these lines do not stop there and, thanks to map dowsing the real complexity of the system in the UK will be revealed. The information is initially derived using map dowsing techniques and is presented using reconfigured Ordnance Survey OpenData maps. Lines are added as an overlay plus, in some cases, actual GPS coordinates may be given in separate documents as real time verification of line positions is obtained. Most of the maps in the south of England have now been updated to include a numbered grid overlay which makes it very easy to work out locations according to the Ordnance Survey Grid Reference system. See the Map Help page for more details. Download the maps via the maps entry point here. To display the maps without problems or too much delay, you will need a moderately powerful computer, preferably at least 2 processors, typically 4Gb of memory, a fast broadband connection and a high quality pdf reader such as Adobe Reader.